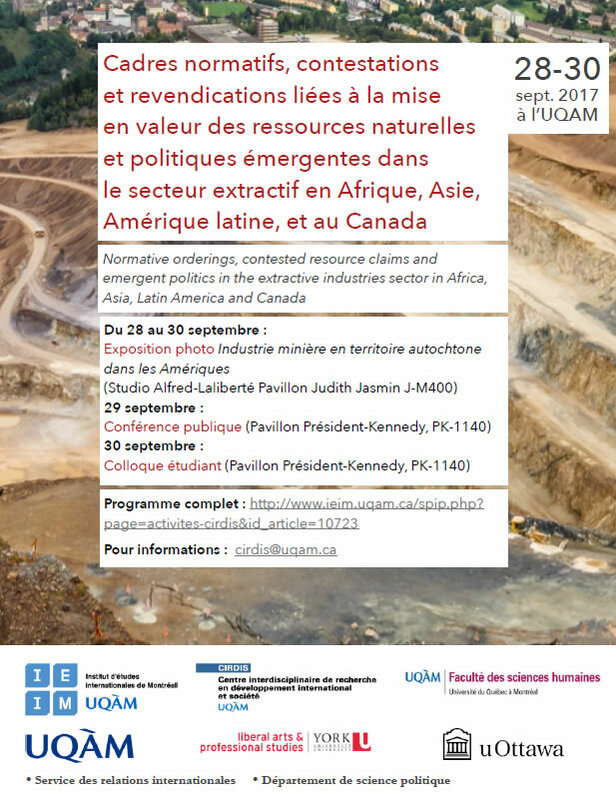 L’exposition photo "Industrie minière en territoire autochtone dans les Amériques" se tiendra dans la foulée de la Conférence internationale "Cadres normatifs, contestations et revendications liées à la mise en valeur des ressources naturelles et politiques émergentes". This travelling photo exhibition is a Canadian adaptation realized by Marie-Josée Massicotte and Karine Vanthuyne (Associate Professors, Faculty of Social Sciences, University of Ottawa), ), of a project that was originally developed by Paul Hersch Martínez in Mexico, in collaboration with Lilián González Chévez, Mariana Solorio Damián and Catalina Sedano Díaz, and the Actores Sociales of the Flora Medicinal in México (as part of the activities of the Instituto Nacional de Antropología e Historia (ASFM-INAH) and the Movimiento Moralense contra las Concesiones Mineras de Metales Preciosos). The photos and the accompanying text describe the social and environmental impacts of the dramatic development of the Canadian mining industry in Canada and abroad. In so doing, they give voice to Indigenous communities in Canada, Guatemala and Mexico that are affected by the new mining imperative. The exhibition also discusses the political, legal, economic and social changes that are required to rebalance the fundamentally unequal power relationship which, historically, has favoured the interests of the mining industry to the detriment of those of the affected communities and territories.